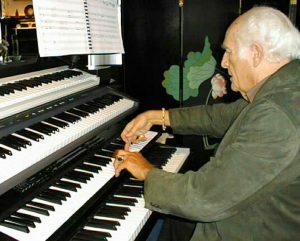 Dr. Mills’s extensive musical training also found expression in his orchestral keyboard compositions. Sitting before four electronic keyboards, he had hands that were refined by countless hours in the earlier years of his life, playing the masterworks of the classical piano repertoire. The compositions “happened” in real time with no overdubs, in a single performance with each of the keyboards set up for different sounds. He would fly over the machinery, indeed seemed to float above it as he imparted a richness of feeling and naturalness to simultaneously composing and performing a new work! Kenneth Mills’s special artistry reveals the soul of one who defied the limitations of what would seem to be mere electronic keyboards and allowed the heart-feeling to come forth. Many of Kenneth Mills’s compositions have been recorded and released on four CDs. Visit our online store to read more about them and download.